Strawberry Chic: Get Inspired Thursday! I often find that gathering inspiration from things like photos, fabrics, magazines, knick-knacks, and art work is the best place to start when trying to design a space. I often look through books, magazines, and of course blogs to collect pictures and ideas of things that I love. That way, when I'm trying to select a color pallet or need a decor idea for one of my stark white walls, I have a starting point or a look that I would like to re-create. So in honor of this concept I would like present "Get Inspired Thursday" where I will be posted my favorite inspirational finds for the week! 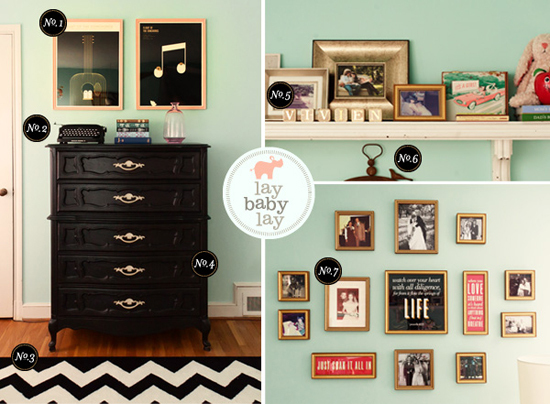 This week I stumbled across the most amazing nursery I have ever seen over at Lay Baby Lay. It makes me want to re-do my little man's nursery entirely! This oh so charming room was designed for a girl, but with a few accessory changes (mainly switching out the pink for blue or green) I think it could work perfectly for a boy too. I want to re-do MY room like that. The throw rug is something I would have never thought to do with those pale colors...but it sooo works! 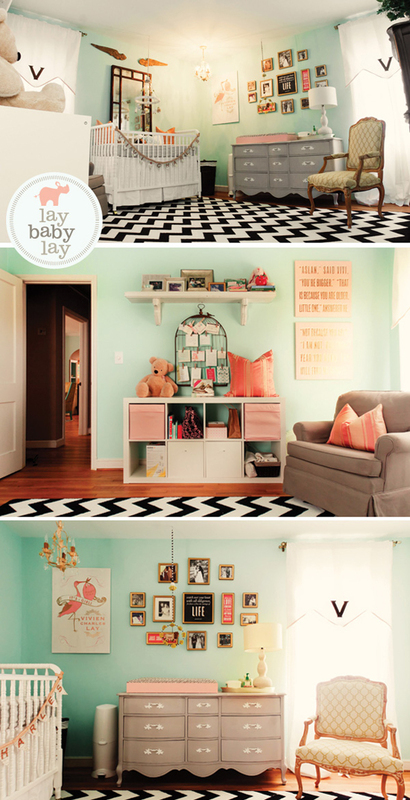 Charming nursery...Too bad my baby is 15 and I'm too old to catch a "case of the babies"! I saw this nursery a couple weeks ago. I saved the pics and link, too. I'm in love with the grey dresser with white handles and that chevron rug. I have been searching Craiglist like crazy to find a dresser like this one to redo. Beautiful.